So almost all the teams have one game under their belts. Just a couple more games left. Sox didn't start so good, but that's why the season is 162 games. 50 you will win and 50 you will lose. What you do with the other 62 defines your season. Couple images to share based on a trade and a PWE. But both were set needs, and very welcome mailings at the 2x3 domicile. A bunch of Series 1 cards from Pat at Hot Corner Cards. I won't share them all since we all know the design. 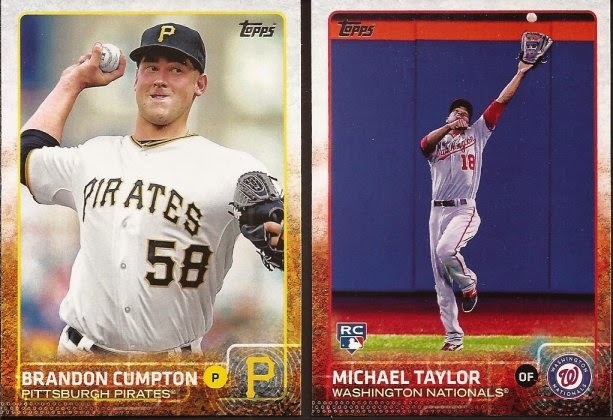 For my ranting recently about Topps fear (or hatred) of feet, that Taylor is a card that actually would have been nicer just a little closer. How sweet would that have looked with the red warning track framing the bottom and that red top of the wall framing the top. Then again, all the red at the bottom would have been brutal on the eyes. Here's some from my first Zistle trade. It only was a Zistle trade because I couldn't find an email address, and Wilson wasn't responding to a couple comments I left at Tenets Of Wilson Luckily, we are contacts on Zistle, so a proposed trade on the site turned into a swap of needs for both of our 2010 Turkey Red sets. I still have needs for both Turkey Red and Series 1. Maybe you have some cards on my Wants page? Thanks to both of you. Here's to baseball on the south side come October. Well, let's hope that games 2-162 are better than what we saw of both Chicago clubs thus far.